Color blindness is a condition in which a person is simply not able to recognize red, green, blue or a mix of these colors. In rather rare cases one is not able to recognize any color at all. The condition may significantly interfere in one's life and restrict a person from performing some activities such as driving. Such patients are also not able to have certain careers that require proper color differentiation. In majority of cases color blindness is inherited. This is actually a genetic disorder and is present at birth. Healthy people have three types of cone cells in the eyes. Each of them is in charge with recognition of three colors, red, green or blue. The brain recognizes the color when the cone cells sense different amount of these three basic colors. Most of these cone cells are located in the central part of the retina. In case of color blindness the person does not have one of these cone cells or they are present but simply do not function properly. By being unable to see one of these three basic colors the person sees different shades of the specific color or sees a different color. The problem is permanent and cannot be corrected. Apart from being inherited color blindness may be acquired. In this case inability of one to recognize basic colors is associated with the process of aging and some eye conditions such as glaucoma, macular degeneration, cataract and diabetic retinopathy. Even injury to the eye and intake of some medications may induce color blindness. A person may see many colors but he/ she is not aware that there is a difference between some colors. Furthermore, a person may be able to see a few shades of color while other, healthy people normally recognize thousands of shades of color. And finally, in extreme cases one is able to see only black, white and gray colors. There are specific tests that can easily measure how well a person can recognize or differentiate colors. One of them is a set of colored dots. They form a specific pattern such as a letter or a number. People suffering from color blindness cannot spot the number or the letter of the color they cannot recognize. There is one more test in which the person must arrange colored chips in specific order, according to the color similarity. Patients suffering from color blindness fail to arrange these chips properly. 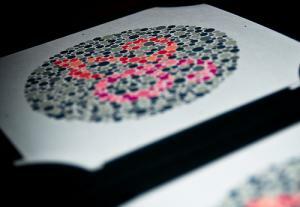 Can Color Blindness be Treated? In case the condition is inherited it is simply untreatable and incurable. It lasts for life time. Certain acquired color vision problems may be treated. This generally depends on the actual cause. For example, patients suffering from cataract and accompanied color vision problems may be cured once the cataract is surgically dealt with. Lenses for the color blind people? Is there a way to prevent cataract?